The development of Buddhism in Thailand has a long history. In order to go into detail about its history, it is necessary to divide it into three different key periods of time, all which have greatly influenced this religion and the spiritual founder Siddhartha Gautama. These three time periods that we will look at include: Theravada, from the Asoka period; the Mahayana period; and finally, the Theravada from Sri Lanka. Siddhartha Gautama’s life accounted for his life discoveries, monastic rules practiced, and path to enlightenment, which is followed by current Buddhists. First, we will look into the period were Buddhism first started in Thailand during the Theravada from Asoka’s period. Buddhism was introduced and established by King Asoka in Patalilbutta City during the 3rd century B.C. King Asoka sent monks out of the country to follow and learn about Buddha’s teachings. While other monks were learning the ways of Buddha, two monks stayed behind in Thailand to teach people there. During this period, the first signs of Buddhism were seen in Thailand and became very prevalent. Since the introduction of Buddhism in Thailand, it became noticeable that these beliefs also started to spread to other areas of Asia during the Mahayana period. King Kanitsaka the Great had the intention of spreading Buddha’s teachings farther than just his kingdoms. He began to send groups of monks throughout Central Asia in order to help spread the word. Once Mahayana’s Buddhism expanded into Thailand, it became widely accepted by the people. Mahayana’s Buddhism spread from the southern regions, to the north via the central areas of the country. This created a large multicultural society, with different dialects that still, today, inhabit the Thai language. The spread of the beliefs of Buddhism had officially begun in Thailand. Finally the period of Theravada from Sri Lanka, also established itself in the Thai culture. The type of Buddhism that was introduced during this period in time is still a part of the current Thai culture. It has gone through some challenges, but has been able to get back on its feet each time. 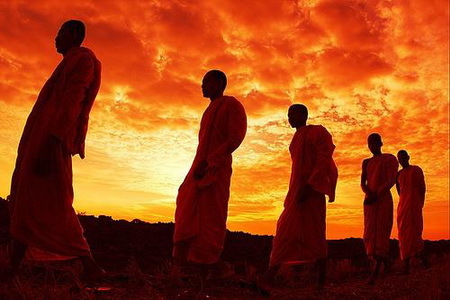 The Theravada Buddhism in Thailand is now known as Lankavamsa. This is because, 700 years ago, King Ramkhamhaeng had asked senior monks from Sri Lanka to come teach their views of Buddhism, which became the birth of Lankavamsa in Thailand. Siddhartha Gautama or “Buddha” was born approximately 583 BCE, in which is now known as Nepal. His name “Buddha” translates to “the enlightened one”. He was born into a family with a King as a dad and a queen for a mother. His parents were the leaders of a large clan called the Shakya. A few days after being born, a holy man prophesized that Prince Siddhartha would either be a great military conqueror or a great spiritual leader. When his dad caught wind of this, he made the decision for his son, which was that his son would not become a spiritual leader. King Suddhodana raised his son in luxury and shielded him from learning about religion and human suffering. By the time Siddhartha turned 29, he was completely sheltered, having very little experience in the outside world. Over time, Siddhartha’s curiosity grew and he knew he wanted to experience the outside world. His curiosity finally broke one day and he was taken on a series of rides through the countryside by chariot. These adventures drastically changed the views that Siddhartha had on this new world. A couple of things that left a lasting impression on the prince were seeing an elderly man, a very sick man, and a dead body. These three things, the sheltered prince had never experienced, changed his view on the outside world. The final thing he saw on his countryside journeys was an ascetic, wandering the countryside. Siddhartha took great interest in this ascetic, asking for an explanation about this type of person from the man that was showing him the outside world. The guide said that ascetic was a person who had renounced the world and tried to find release from fear of death and suffering. These sights combined, were the turning point for Prince Siddhartha’s own life and altered his views of the world. Once Siddhartha returned home and his life there, things had changed for him. He no longer took any interest or pleasure in the life that he had within the palace walls. Even the arrival of a new son could not bring him happiness. Everything that he grew up loving and playing with now had no value. After some time, he finally realized that he couldn’t live in the palace any longer. One night, he made the decision to leave the home. Siddhartha shaved his head and traded his clothes for a beggar’s and began his journey to find enlightenment. He started his journey by searching for popular teachers who taught him about different religions and how to meditate. After spending a great deal of time learning everything he could about religion, he still had questions and doubts about it. That’s when Siddhartha had the idea to team up with five other disciples to try and find enlightenment on their own. First they tried to find enlightenment through physical discipline by inflicting pain and fasting to near starvation. Still, that did not meet the satisfaction that he wanted. He found that by getting rid of pleasure, he had accepted pain and self-indulgence. Siddhartha found himself in between the two extremes. He then came to the realization that instead of starvation he needed food. He had to have it so that he could build up strength to continue his effort of finding enlightenment. This understanding and realization helped Siddhartha reach his goal. Siddhartha’s path to enlightenment came to him in forms of mythological battles with Mara. Mara was a demon that stood for the passions that trap and deceive us. Mara would bring large armies of different monsters to attack Siddhartha’s mind. Siddhartha remained still and untouched by Mara’s monsters. After many attempts to dethrone Siddhartha from enlightenment, Mara announced that the seat of enlightenment belonged to Siddhartha. From then on, Siddhartha vowed to share his enlightenment with the world as his witness. After realizing his enlightenment was complete, Siddhartha Gautama became Buddha. From the early stages, Buddha didn’t feel that he could teach because of what he had done to gain it, was not through words. The only way that enlightenment could happen was with a clear mind and discipline. He believed that people, who didn’t already have experience, would not be able to fully understand what he was trying to express. With all this in mind, his compassion pushed him into trying. He started his teaching in India and preached his first sermon there. This sermon would go on to be the centerpiece of the Four Noble Truths. The four noble truths include: 1) Suffering does exist 2) Suffering arises from attachment and desires 3) Suffering ceases when attachment to desire ceases 4) Freedom from suffering is possible by practicing the Eightfold Path. Along with the four truths of Buddhism, there are three basic principles that include: 1) Karma 2) Wisdom 3) Passion. Karma is the law Buddhists follow which implies that every cause and action has an effect. Karma tries to give reasoning to why things happen that may be considered unexplained or unfair. Karma challenges each follower to be conscience and respectful of their life decisions to avoid future troubles. They do this through 3 steps in their though process: 1) think about the reasoning for their preformed action 2) Effect of the action upon themselves 3) Effect of action on others involved. Wisdom is key in reaching enlightenment. Buddha taught that great wisdom could be achieved through compassion. It is important to understand the truths of life and reality. True wisdom requires a pure, clear, and open mind to obtain patients, courage and intelligence. Lastly is Compassion, which is simply the understanding of others emotions and feelings. If Buddhists can understand that of others they can understand the emotions and feelings of others in order to become enlightened. Buddha laid out these ways for people to find enlightenment for themselves and he dedicated his time to teaching bringing to large audiences. He continued to travel and teach until he died at age 80. In conclusion Buddhism is simple in its teachings to lead to a moral life, be mindful and aware of others thought and emotions, and develop wisdom and understanding to lead to a pure and enlightened lifestyle. Buddhism is one of the oldest religions practiced in currently in Thailand. It is not just a religion but also a lifestyle characterized by many movements, splitting, and expansions across Asia. Sathien Bodhinantha, Initials. (n.d.). Buddhism in the kingdom of thailand. Retrieved from http://mahamakuta.inet.co.